Fabinho‘s omission from the XI for Liverpool’s 2-1 win over Tottenham was met with bemusement, and it is clear he should now start every remaining game. 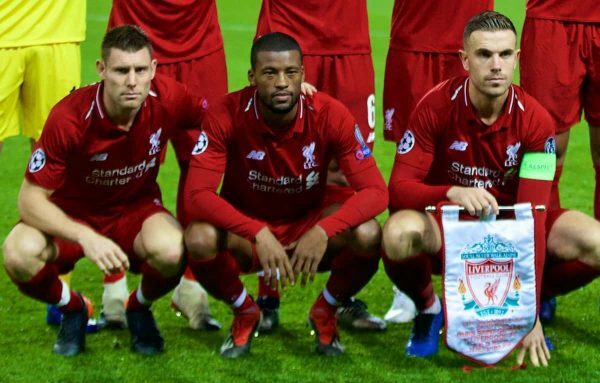 Before Sunday’s victory at Anfield, Jurgen Klopp explained his decision to name Jordan Henderson, James Milner and Gini Wijnaldum as his midfield trio. “Of course we change players because we have enough, that’s good, they are all fit in the moment, that’s good as well. They’re all in good shape, which is even better,” he told Sky Sports. “Hendo came back early this week, trained really well, Milly the whole week, Gini showed up [and] looked good and they’ve played already together. Now seemingly set on a 4-3-3 formation between now and the end of the season, Klopp has six options for three roles—seven, if counting the very unlikely prospect of Xherdan Shaqiri being trusted centrally again. The call to omit Naby Keita—who has neither consistently impressed or been consistently fit—and Adam Lallana—who has only started against Burnley (twice), Huddersfield, Cardiff, West Ham and Fulham in the league in the past two seasons—was justified. But opting to name Fabinho on the substitutes’ bench, regardless of his later return from international duty, was a questionable one. It was perhaps no surprise given Klopp has preferred the Henderson-Milner-Wijnaldum triangle in eight of 15 big games against top-level opposition this season, while Fabinho has only started in five—one more than Keita. This is raised to nine if considering the 1-0 loss to Napoli in October, which saw Henderson replace the injured Keita after just 19 minutes. 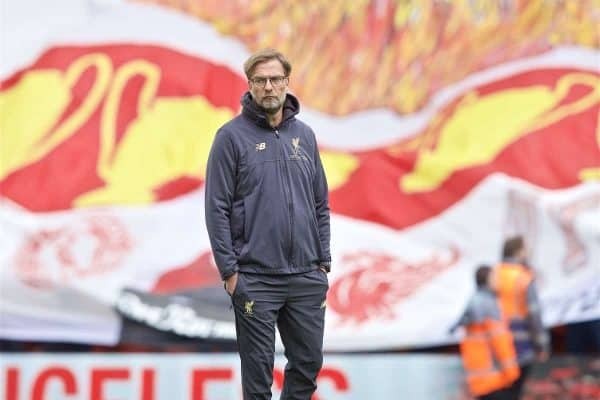 But of those nine games, the Reds have only won four, drawing two and losing three, scoring 12 goals, conceding nine and keeping just two clean sheets. If the rationale is that “they’ve played already together” and they provide stability due to their industry, it is one worth scrutiny. 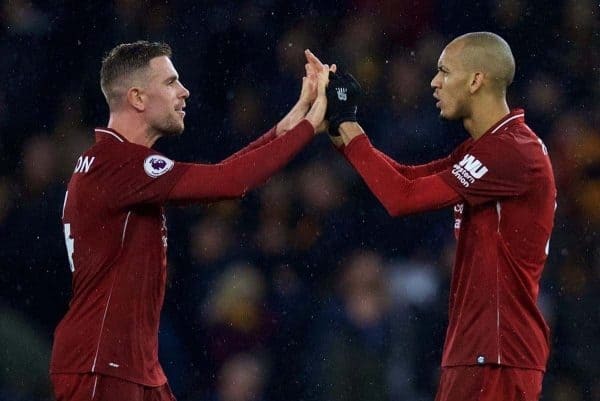 “It could be any of three [that he replaced], it’s not a single person you point at,” Jamie Carragher argued after Fabinho‘s pivotal cameo on Sunday, having taken Henderson’s place with 13 minutes to play. “It’s just that Liverpool’s starting midfield are very similar players, you know exactly what you’re going to get. The timing of Fabinho‘s introduction to the game, seven minutes after Lucas Moura’s equaliser and seven before Virgil van Dijk‘s game-changing one-on-two heroics, was vital. With Henderson struggling to provide either defensive strength or creativity in the No. 6 role, there was a noticeable lift in the Anfield crowd when the Brazilian snapped into a challenge within two minutes. His first two passes were first-time balls forward, the second a lofted pass that would have seen Sadio Mane through behind the Spurs defence were it not for the backtracking presence of Alderweireld. Eight of his 10 passes (80%) were directed forwards, compared to Henderson’s 28 of 47 (59.6%), and while it would be wrong to suggest this as quantifiable evidence, it was clear that Fabinho put Liverpool on the front foot. The 25-year-old is a natural defensive midfielder, but he is able to balance this with a genuine thrust moving into the final third, which was paramount given the setup had switched to a 4-2-3-1 shortly before he came on. 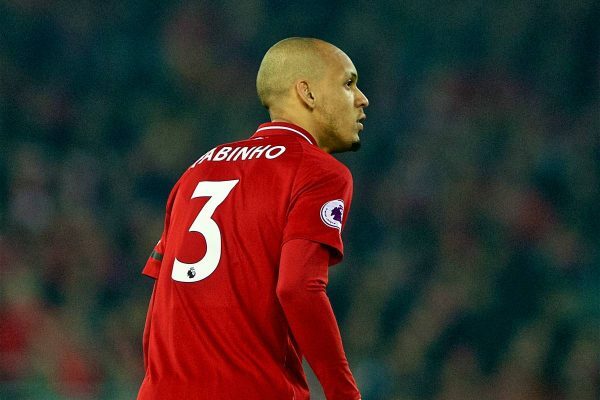 His ability to provide both backbone and freedom to the midfield, along with the flexibility of both systems, should make Fabinho a guaranteed starter in each of the final six games of the Premier League campaign. 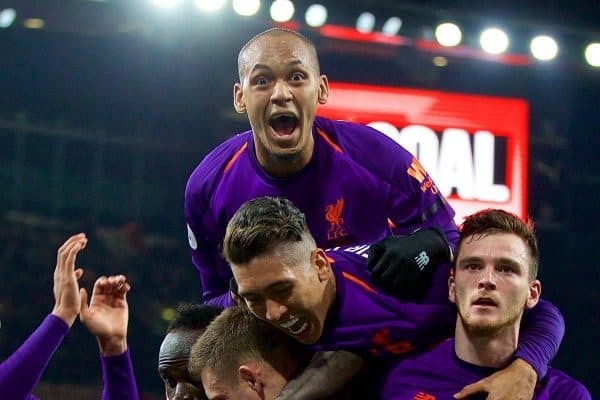 Though its significance is skewed given Liverpool have only lost once all season, it is worth noting that Fabinho is still unbeaten when he has started in the English top flight: 13 wins, four draws. He has averaged the most successful tackles (2.6) of any Reds midfielder to play 500+ minutes in the Premier League, and also the joint-most key passes along with Wijnaldum (0.8). Only Milner (eight) has contributed to more league goals than the No. 3 (three), whose efforts are equal to those of Henderson, Wijnaldum, Lallana and Keita combined. 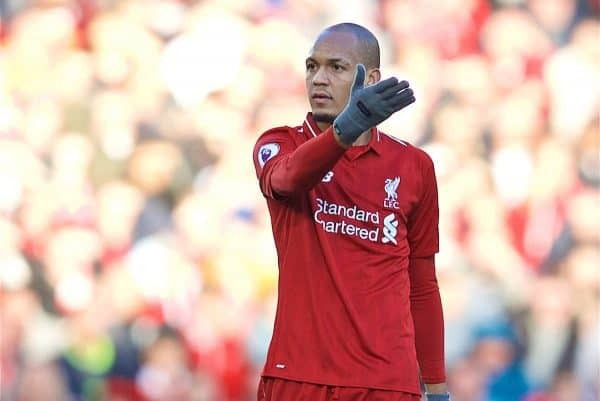 Fabinho is also unbeaten in all five big games he has started in, along with the 3-1 win at Bayern Munich which saw him replace Henderson after 13 minutes: three wins, three draws, 12 scored, four conceded, two clean sheets. He is undeniably a big-game player, and one of few proven title-winners in Klopp’s squad, and his inclusion in the six remaining league outings should be non-negotiable. “Of course he had a proper impact, but he only had to play 15 minutes against a tired side,” Klopp said after Sunday’s win. “That’s how it is, but of course he was brilliant. He hit a lot of really balls, passed the ball. “First half we had a lot of very good moments, but not enough, if you want, to have a higher result. “But the boys who started the game did really well, and if you bring on a sub, they have to make an impact. This posits Fabinho as the impact sub in big games, and the evidence points toward this: he has come off the bench in six of 15 so far, and barring his early introduction against Bayern, three were when Liverpool were either drawing or losing. However, Klopp’s assessment of his options should instead be restricted to who partners him, whether that be in a midfield two in a progressive 4-2-3-1 or a more robust trio in the 4-3-3. Eleven months on from his arrival, our No. 3 no longer needs to earn his stripes, he is now undeniably one of Liverpool’s best players. And he should be one of the first names on the teamsheet in pursuit of the title.